We have been considered as leading names in the industry engaged in offering a quality-assured range of Autopsy Tables to the customers. The range of tables offered by us are highly demanded in the market for its durability, rugged construction and minimal maintenance. We also provide the facility of customisation, in order to meet the exact requirements of the customers in an efficient manner. Our product range includes autopsy tables such as Electro Hydraulic Autopsy Table and Autopsy Table. 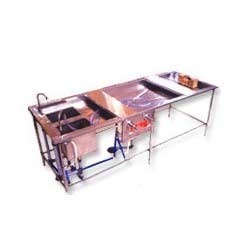 We are instrumental in offering Autopsy Workstation to our clients, which is typically consists of a standard table with raised edges that has faucets and drains used to wash away collecting fluids during the internal investigation. We engage in providing these work stations which are fully equipped with requisite features to provide a clean hygienic and functional platform for performing autopsies. The design of the autopsy workstation includes a dissection wing and a base cabinet, which provides extra storage. The work surface is free from all rivets and bolts. Therefore, it provides a smooth and hygienic surface to the pathologist. The stainless steel construction offers a clean bacteria free platform. Andhra Pradesh,Arunachal Pradesh,Assam,Bihar,Chhattisgarh,Goa,Gujarat,Haryana,Himachal Pradesh,Jammu and Kashmir, Jharkhand, Karnataka, Kerala, Maharashtra, Manipur, Meghalaya, Mizoram,Nagaland,Odisha,Punjab,Rajasthan,Tamil Nadu,Telangana,Tripura,Uttar Pradesh, Uttarakhand,West Bengal,Andaman and Nicobar Islands,Chandigarh,Dadar and Nagar Haveli,Daman and Diu,Delhi,Lakshadweep, and Pondicherry. 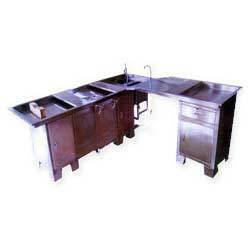 We are instrumental in offering our patrons a quality range of Autopsy Table. These Tables are manufactured using high quality raw materials like Rivets, Bolts or other devices, which are procured from the most reliable vendors of the industry. These Tables are efficient in providing a smooth working surface to the pathologists. These are fabricated using 304 types of stainless steel, which offers easy to clean, hygienic platform for performing autopsies. Served Locations : Andhra Pradesh,Arunachal Pradesh,Assam,Bihar,Chhattisgarh,Goa,Gujarat,Haryana,Himachal Pradesh,Jammu and Kashmir, Jharkhand, Karnataka, Kerala, Maharashtra, Manipur, Meghalaya, Mizoram,Nagaland,Odisha,Punjab,Rajasthan,Tamil Nadu,Telangana,Tripura,Uttar Pradesh, Uttarakhand,West Bengal,Andaman and Nicobar Islands,Chandigarh,Dadar and Nagar Haveli,Daman and Diu,Delhi,Lakshadweep, and Pondicherry. The SP-200 delux is further eqipped with height adjustments.It comnines all reatures of an advance table providing increased efficiency in autopsies. 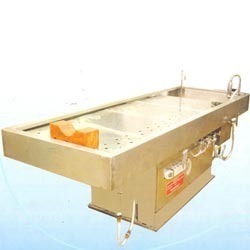 Our customers can avail from us a quality range of Electro Hydraulic Autopsy Table. These Tables are manufactured using high quality raw materials that are procured from the most reliable vendors of the industry. These Tables are efficient in providing a smooth working surface to the Pathologists and Autopsy Surgeons. These Tables offer easy to clean, hygienic platform for performing autopsies. Construction type 304 stainless steel with large radius inside corners for easy clean up. Mounted on central supports column. Remote controlled 2button height adjustable systems from 750mm to 1000mm. Regulated sprinkler systems for table surface, ensures continues self-cleaning. "Reverse-flow" Hydro aspirator with built in vaccum breaker. Splash proof electrical outlets provided. 4 piece perforated body support grid plates. Down-draft ventilation cone system incorporated for minimization of odors if attached to external ventilation source. Access door for central coloumn. Wrist operated stainless steel faucet with hot and cold flow control valves. Optional hands free flow device can be attached to the faucet. Plumbing provision for usage of hot & cold water. Table length 104" Width 30" approx. Engraved measurement scale on one side for easy measurement of cadaver. Manufactured without rivets,bolts or other devices on the work surface so that it remains smooth and prevents cumulation of bacteria. Looking for Autopsy Tables ?